This blog is no longer maintained or updated. The blog content remains here on eastsidesc.com merely for historical, archival purposes. For current content and informational posts, please see our public page on Facebook: https://www.facebook.com/eastsidesc/. World champion, gold medalist and Grand master (!) Ita Pantilat managed a 116 kilo total (50/66) at the masters weightlifting world championship in Denmark. She was quite a bit under her weight class (weighing in a 55 kilos for the 58 kilo class) and had some nagging aches and pains and she still managed to place atop all of the women posting a 168.55 sinclair. Great work Ita, we are all so proud of you and your amazing efforts. Inspiring! 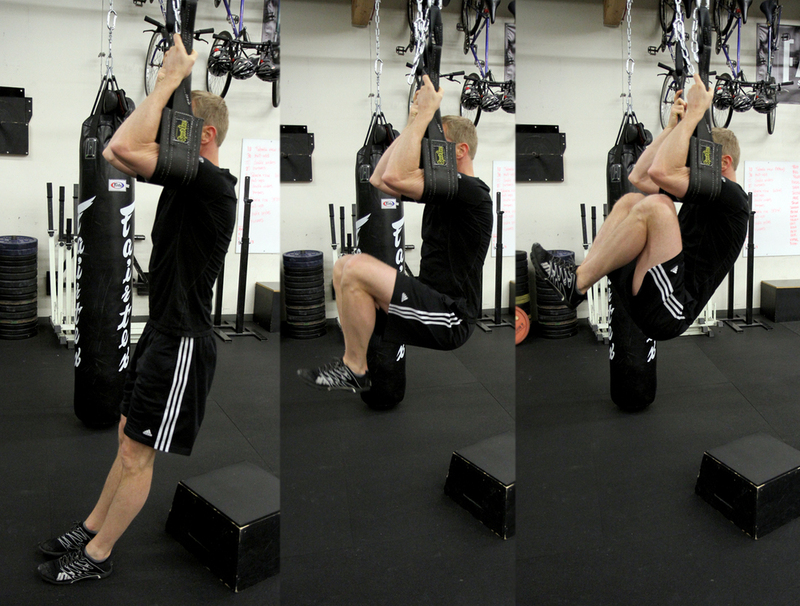 Hanging knee raises add good stress to abdominal training. Knee raises make for a good post training assistance exercise. We use them with and without weight, chains etc. We choose Spud, Inc. Straps and Equipment straps because the quality is outstanding. The 2014 Washington State Championships are in the record books. Susan set new state and national records in the 52 kilo "open" and masters classes. Since her last power competition (Oct 2013-see below post), Susan set a new total of 239 kilos (previous 222.5), a new squat PR of 92.5 (previous 82.5), a bench PR of 47.5 (previous 45) and deadlift 100 (previous 95). Way to stay strong Susan! More photos and other barbell training information can be found on our FB page here. Purchasing and maintaining quality training equipment is important. One thing not to skimp out on is quality of the barbell. We look for a barbell that will meet our performance and training requirements, and hold up to the rigors of daily training sessions by a large group of trainees. We run 29 barbells in our facility and invest time daily, weekly and monthly to ensure that they will last and perform for years to come. One important aspect of bar maintenance is keeping the knurling clean and clear of chalk, skin and other foreign bodies. We use a soft wire brush to clear the knurling, and then alcohol and a shop rag to disinfect and clean any remaining debris. Susan with a 82.5 kilo (181 pound) second attempt squat. Susan was a 52 kilo lifter at this meet. Susan entered her first meet of the season, the Team Phoinix Powerlifting Bash. This was a local meet that was very well managed. Lots of great lifters went for personal bests in the Squat, Bench and Deadlift. Susan had a very successful first meet, winning best female lifter, also setting a state record in the deadlift. Congratulations on your success in training Susan. Here is a link to Washington State power lifting site: http://www.nwusapl.com/wa which is where you can get local meet information. Susan received the Best lifter trophy at the 2013 Team Phoinix powerlifting bash. Don't forget that we will be CLOSED on Monday Sept. 2 for Labor Day. Saturday class at 10:00 is still on though. Happy holiday, everyone! We are excited to host the October 18-20 2013 Starting Strength seminar at ESC. This Seminar is an intensive exposure to all the information from which the Starting Strength system is derived. This seminar is a 3-day format focused on in-depth exploration of the theoretical basis of the system, as well as a thorough under-the-bar practical session for each exercise. Please share and get the word out. Thank you!